Trish Burr Booklets – Give-Away Winner! It’s my pleasure to announce the winner for the pair of Trish Burr booklets from last week’s give-away! The booklets are Traditional Embroidery Colour Schemes and Introduction to Miniature Embroidery. Both booklets are available through Trish Burr’s Etsy shop – and I believe the miniature embroidery one is even available as a digital download, which is always handy (and quick, and usually a little less expensive – no postage involved, either!). Ok, so, on to the lucky winner! with the appropriate accompanying colours of the season. I love white on white and cream and visa versa too. Oh, congratulations, Kathy! Do send me your mailing address and I’ll get those out to you some time soon – hopefully by the end of the week! Uh… I just realized I don’t have my planner and calendar in front of me. I can’t remember what’s coming up this week! I know there’s a nifty little tutorial at some point, involving stitching. Other than that, I suppose we’ll all just have to be surprised! I hope you have a terrific Monday! March 26, 2013 Give-Away! Trish Burr Books – Great Little Supplements! And congratulations to Kath from Oz. Thank you so very much Mary and Trish for this fabulous give away. I know I will treasure every page for it’s inspiration and instruction among other wonderful things. Congratulations Kath! 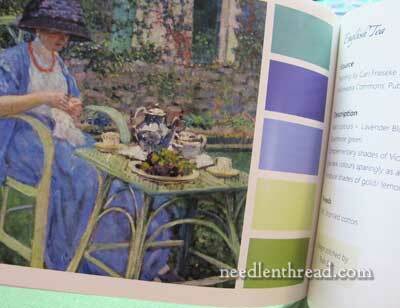 I have the Colour Scheme book and find it very useful, not only for embroidery great for decorating. Well done Kathy enjoy your prize. Can’t wait to see what’s on this week Mary hope you find your planner calendar, some surprises in-store for us! This is so exciting! I believe that you were one of my classmates in the recent “Vintage Garden Strawberries” thread painting Online class hosted here at Needle ‘n Thread! That is wonderful that you won these terrific books by Trish Burr! Congrats! Yes, sure was Bonnie. Great to meet up again, and thank you. I’m thrilled with my win. I’m so pleased I did the class. It was wonderful in many ways, and not least for our very helpful and ‘interactive’ teacher and fellow classmates. Cheers, Kath. Congrats Kath, you are one lucky lady. Where do you live – I might be able to come on over for a ‘play day’, HA. BTW Mary, my curiosity is piqued. Until now I assumed that even though we ‘furriners’ entered that we weren’t really in the running, but now that Kath has won I see that is not the case, so how do you choose the winners? Previous Previous post: Happy Easter – and a Free Pattern!